Dental implant is an artificial tooth root made of a biomaterial, which is placed in the socket of the lost teeth to carry a tooth replacement. The material is generally pure, unalloyed titanium, which is completely accepted by the human body. Our dental implants are also produced from pure, unalloyed titanium designed for medical use, and comply with the most rigorous European standards. In the last years dental implantology has gone through an outstandingly great development. With a good implantation and a properly prepared prosthesis, implants can remain effective and last a lifetime. An implant-based prosthesis is just as strong, useable, and attractive as your original teeth. The dentures and bridges fixed by the implants do not move in the mouth which is an important advantage during eating and speeching. Our Implant System (manufactured by the German Hager&Meisinger GmbH) offers highquality, world-class dental implants at a very reasonable price. In case of one or a few missing teeth in the middle of the row the implantation can be solved by preparing an implant for the root of the lost teeth, while traditional prosthesis can only solve this by damaging neighbouring healthy teeth. By implantation fixed prosthesis can be created also in cases when traditionally only a partial removable denture could be prepared. In these cases implant-based tooth replacement provides more stability and better chewing strength than traditional solutions. Besides feeling physically better while eating, the patient feels psychologically better because of looking better. All these factors together improve the patient’s quality of life. 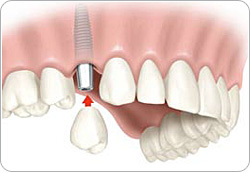 The implantation is also a good solution in case of the complete loss of teeth. Using the implant as a pillar it can serve many ways by fixing the prosthesis: on one hand the implant can retain the removable denture (so-called round-headed retention or retention rod ), on the other hand, a fixed prosthesis can be prepared with a sufficient number of implants (bridge or so called overdenture prosthesis). Have allergy or tumorous diseases been noted in connection with implantation? Implants are made of pure titanium. This material had special biological characteristic – namely bone is able to integrate with it. We cannot find any record of allergy or tumor in connection with implants in literature, as their surface is covered by a stable compound, titanium – oxide. This material does not dissolve in bodily fluids, so the immune system does not react to it. Who do we advise to try dental implantation? To all patients who choose this solution and who have no contraindications. However, implant-based tooth replacement is only recommended to those people who have proper mouth hygiene and are willing to follow the mouth hygiene rules proposed by the dentist. Crucially for the success of the implantation, alcoholism, drug addiction and heavy smoking represent serious risk factors. Certain diseases can reduce the chance of success – like untreated diabetes, cardio-vascular diseases, and some other conditions. Implantation cannot be carried out before the end of the jaws’ growing period (until about the age of 14). How does implantation take place? During preliminary examinations the doctor checks the patient to decide if the dental implantation can be carried out. This includes a dental examination (if the jaw is suitable for receiving the implant, taking of X-ray shots, which teeth must be substituted, what kind of implant is needed, etc. ), and general medical examinations. Then comes the planning of the implantation process (how many implants would be needed, if the patient wants a temporary prosthesis during the period of osseointegration, the expected costs of tooth substitution, making a schedule, etc.). 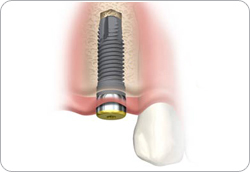 The implant is placed into the jaw quickly, easily and safely, in an outpatient setting and under local anesthesia. The suture is removed one week later, and following this the implant begins to heal under the gums. The implants heal within the bone osseointegration. The healing process takes about 3 to 4 months. Osseointegration ensures the implant to be fixed in place and become able to support a normal biting load long-term without any damage. After this, an artificial abutment replacing the tooth is placed into the implant, and this abutment will serve as the basis of the dental prosthesis. The tooth replacement is prepared in the dental laboratory in a short time in the usual way. Contact between patient and dentist does not stop here, with placement of the new implant tooth. Among the most important criteria for long-run success in dental implantation are good mouth hygiene and regular medical check-ups. Patients wearing implant-based tooth replacement must regularly attend examinations (once a year). The rate of successful implantations is above 97%. The lifespan of the implants depends on the place of the implant and the patient's oral hygiene.